Celebrex is an NSAID (Non-Steroidal Anti-Inflammatory Drug), a class of pain relievers that also reduces inflammation. This type of painkiller blocks the production of prostaglandins, a substance made by cells in the body which causes pain, inflammation and fever. Celebrex contains the active ingredient celecoxib, a so-called COX-2 inhibitor. As Celebrex is less likely to cause side effects on the stomach than other anti-inflammatories, it is often prescribed for people who are prone to stomach ulcers or have sensitive bowels. Because of its anti-inflammatory properties, Celebrex is commonly prescribed to treat rheumatoid arthritis, rheumatic pain, arthrosis and Bechterew's disease, but it can also be used for other pain conditions, such as menstrual pain, headache or pain due to fever and the flu. Celebrex capsules should be taken whole orally with a glass of water, preferably during or after meals to prevent gastroenteritic symptoms. Celebrex' effectiveness lasts for a long period of time – just one capsule can provide no less than 12 to 24 hours relief. Symptoms of inflammation (for example of the joints) such as redness and swelling are reduced within a few days or weeks. The duration of the treatment is determined by the doctor. 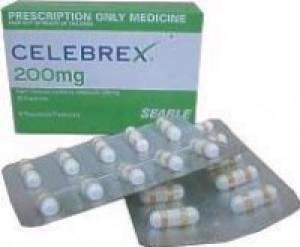 Celebrex is available in 100 mg and 200 mg capsules. The standard dose for adults is 200 mg daily, which can be taken as one dose or two doses of 100 mg. It is important not to exceed the recommended dose. Celebrex is not suitable for children. Celebrex should not be used if you are breastfeeding, are pregnant or would like to become pregnant, in which case you should consult with the doctor about using another painkiller. In rare cases, Celebrex may cause dizziness, sleepiness or drowsiness. Do not participate in traffic if you are experiencing these side effects. If you have a sensitive stomach or are prone to dizziness, it is advisable not to drink alcohol when taking Celebrex. Alcohol may intensify side effects such as stomach pain and dizziness.